Scientists at NASA are now saying that the massive El Niño we’ve all been talking about for the past couple of months is “too big to fail.” And while Southern California will assuredly get the worst of it, Northern California will not go unscathed. In fact, it’s likely to be as big, if not bigger, than the last two strongest El Niños on record (1997-'98 and 1982-'83), during which there was millions of dollars' worth of damage and numerous fatalities. We talked to three experts: Ryan Walbrun, a meteorologist at the National Oceanic and Atmospheric Administration (NOAA); Eric Holthaus, a meteorologist at Slate; and Bryan Allegretto, a forecaster at OpenSnow, to get their thoughts on how bad this winter could really get. They were all very careful to reiterate that these worst-case scenarios may not happen at all, but Walbrun was also quick to remind us that there’s a big wild card for this El Niño since we’re coming out of a historic drought. The last two strong events were both after wet winters, whereas this year, the ground isn’t ready to absorb systems that bring too much rain too quickly. In other words, there’s no precedent for this El Niño. This winter we will face the great unknown. El Niño isn’t even here yet, but those rainstorms a couple of weeks ago in Southern California gave us a taste of what we can expect. The pressure system was slow, which allowed 1.81in of rain to fall in 30 minutes in the Antelope Valley. The result? A huge mudslide that took out eight miles of Highway 58, trapped 200 vehicles, and forced people to climb onto the roofs of their houses to escape the onslaught of wet earth. It’s hard to know where these slides will occur, but folks in areas where there have been recent wildfires should be the most concerned. Holthaus says, “The fire bakes the ground and clears out all of the underbrush, so it makes mudslides more likely to happen.” Unfortunately, this is one you can bet on. “At least a few of those are guaranteed,” he says. So stay alert Napa, Sonoma, and Lake Counties. 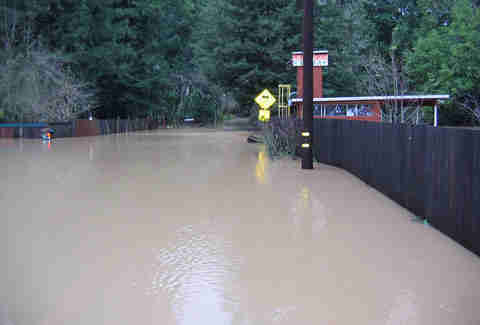 More than 100 Californians have been killed by mud and landslides in the past 30 years. Walbrun also warns of a potential disaster that seems entirely contradictory in nature: even though we’re still in drought, there’s going to be flooding. In fact, the flooding of rivers like the Russian River and the Napa River is a real possibility during slowly occurring precipitation events. Allegretto says in the Tahoe and Reno area, it’s also likely we’ll see the Truckee River coming up over the bank, especially in areas that get a lot of snow followed by rain. Depending on how bad these floods are, they can knock out bridges and roads, wash away mobile home parks, wreak havoc on homes, and sweep people away in a moment’s notice. 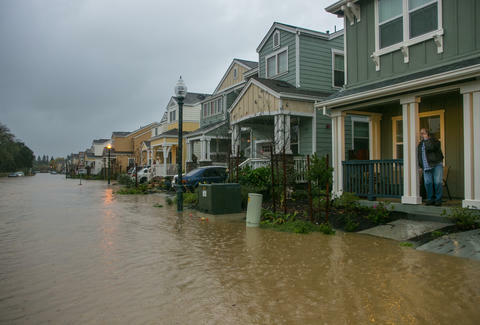 A flood caused by rising water levels is one thing; a flood caused by a dam or levee breaking is a whole other terrifying situation, especially when you consider the extensive levee system in the Sacramento–San Joaquin River Delta. Walbrun states that sometimes, even in a routine winter, a levee will fail, but that hopefully the Army Corps of Engineers sees the impending failure and has time to mitigate it. However, if they don’t, Holthaus says one of those levees breaking could flood all of Sacramento. Worst-case scenario if that happens? Sacramento could be submerged under 20ft of water with more than 500 people dead. OK, after a levee breaking and drowning all of Sac-Town, a downed tree here or there might not seem like a big deal... except that, as Walbrun points out, due to the fact that so many of California’s trees are dead or diseased due to the drought, there are going to be a lot more coming down thanks to strong winds and saturated soil. 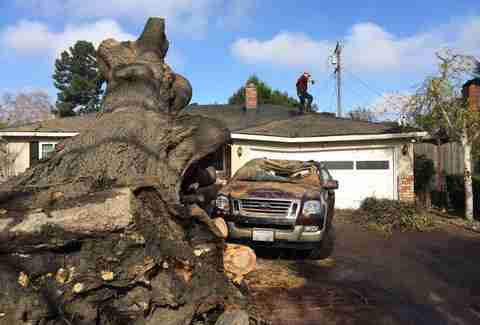 And while you might not care now, you will care if that tree falls on your car. Or your house. Or your car or house when you’re inside of it. Even just a broken-off limb can kill people and animals, destroy property, block roads, and take down power lines. And about those power lines... Expect to lose power often and for longer lengths of time this winter. Losing power for a few hours is an adventure. Losing power for a few days is hell. Avalanches are a risk any time you get a lot of unstable layers of snow, which is exactly what’s likely to happen this winter, Allegretto remarked. “If the snow amount is well above average and then there are extremes between cold and warm causing different layers of snow, you’ll see some big reports of avalanches all over the place.” Thinking you’ll still head to Tahoe, but just stay off of the slopes? An avalanche at Alpine Meadows in 1982 buried the parking lot, destroyed the lodge, and killed seven people. The only reason more people didn’t lose their lives? The resort was closed that day. Just like how roofs can’t always handle the weight of the snow, neither can propane tanks. Pipes, valves, and regulators can all be damaged leading to leaks. And when a tank explodes? It usually takes the entire house with it. 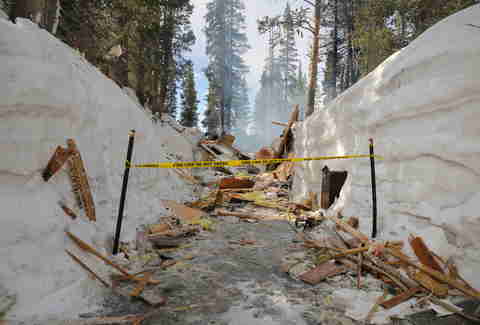 It happened in 2011, when a blast destroyed a home near Donner Summit and sent debris flying hundreds of feet through the air. 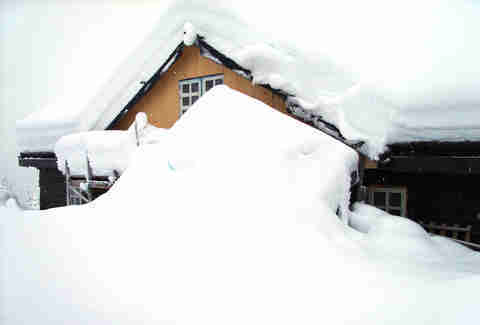 The only reason more homes weren’t destroyed was thanks to the 12ft walls of snow surrounding the house that caught most of the wreckage. So, what does all of this mean for you? Well, obviously there’s not much you can do about a broken levee or a mudslide; however, you can clean out your gutters, have the trees on your property checked, purchase sandbags and tarps (if you live in area that might see flooding), and get your emergency kit (one for the car and one for the house) ready. The hardly noticeable silver lining? It doesn’t look like El Niño’s going to open his fire hose of precipitation in Northern California until January, meaning you still have time to stock up on the beef jerky and vodka. And also, the flashlights and batteries and stuff. Daisy Barringer is an SF-based writer whose biggest fear in life is falling in a tree well while snowboarding and suffocating to death. Follow her on Twitter @daisy and tell her yours.